Every now and then you have an eating experience that is a life shaper, something that stands out in your mind not only for being novel but perhaps also awkward, unusual or challenging to your perceptions of what food can be. Most of mine have been uncomplicated things. Sometimes the experience is also amazing. Eight years ago I had one that was all of those in Hong Kong. I had asked an overseas food contact for recommendations. 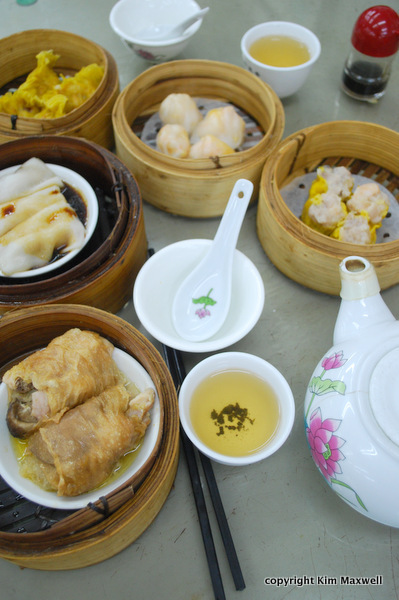 When enquiring specifically about Hong Kong’s speciality dim sum, also known as yum cha, I was warned about a couple of places that should only ever be visited with locals. The first spot turned out to be a dead end, a member’s only dining destination on the third floor of a building. The second was easy enough to find in the humid streets selling traditional wet produce and Chinese paraphernalia, snaking off from a mass of business-district skyscrapers in Central. A flight up past tanks stocked with plump fish, we were greeted by a blast of air conditioning at Lin Heung but no welcome. We stood around and waited for probably five minutes for somebody to notice us. Men in white coats rushed past to top up Chinese tea from giant tea kettles; framed Chinese scenes didn’t liven basic white walls where fluorescent light tubes cast an eerie light in a large windowless room. Ceiling fans whirred. 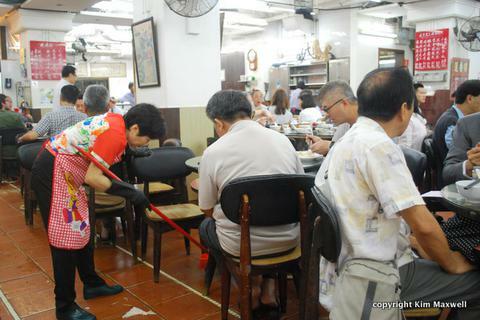 Mostly male diners were seated at plastic stools around multiple round tables. There was a noisy din as people ate, talked and read newspapers. 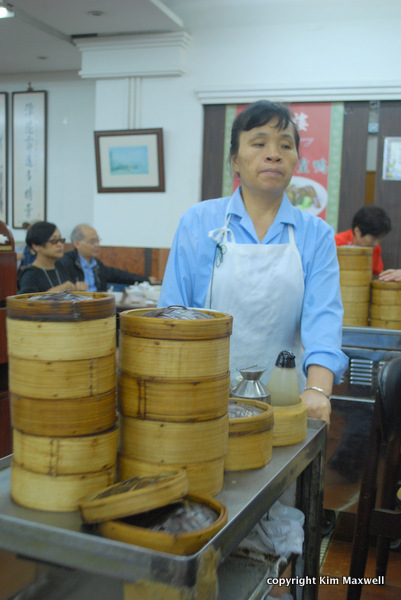 Traditional dim sum trollies were wheeled past, topped with steaming baskets. We so wanted to be a part of it. But we felt silly and, assuming there was some sort of missing cultural code, left. That time we started observing the system. The idea was to hover near a couple of tables until a seat was vacated. Once we sat down a menu strip – all in red Chinese characters – was stuck under the glass table top. Old men at our table carried on reading newspapers; two friendly Asian girls eventually helped us order. They were visiting from Canada. As soon as we accepted any dim sum, items were ticked off and the paper strip was replaced under the glass. One trolley lady stopped and allowed us to point to some items we wanted. Another fled whenever she saw us indicate that we wanted something, her lack of English the reason. We feasted on the best dim sum ever, washed down with tea. We took our slip to the cashier afterwards to be totalled. The meal was ridiculously good value. Fast forward to my July 2016 visit: I asked a Hong Kong friend to join me at Lin Heung as she’d never been. The email with details had been lost, but my previous photos provided some clues. 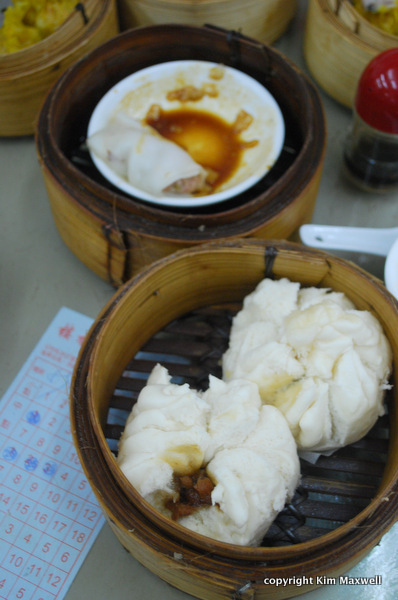 When I googled, I was a little sad to find Lin Heung mentioned on food blogs and TripAdvisor. I learned it had an opening date of 1928. 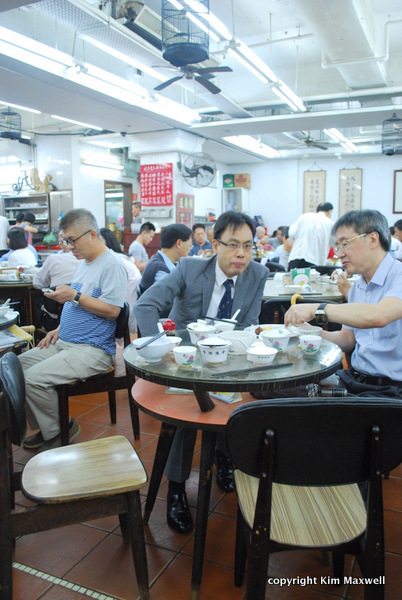 The tea house stools had been replaced by chairs, but it was still packed with the same characters: a mix of mostly very old alongside younger Chinese men. There was a familiar noisy din. But stepping inside had been totally different: we were welcomed, shown to seats and presented with a laminated menu outlining the serving times for dim sum, in English. It doesn’t really matter what we ate: it arrived at the table in stages and tasted as wonderful as the last time. Most of it was pork dumplings, or delicate siu mai containing pork and shrimp filling combos. Or the loose folds of rice noodle rolls wrapped around delicate pork, doused in soy sauce. The great part about places that use traditional trollies is that you can figure it out as you go because the ladies lift the lids, allowing a visual check it out before you accept. The round, spongey char siew bao buns filled with barbeque pork weren’t as light as they could be, but that’s a small detail. Chicken with mushroom wrapped in bean curd skin was so much tastier than it sounds. In 2016 we had help from two Asian girls were at our table again – this time two work colleagues were visiting from Taiwan, where Lin Heung is apparently famous. They offered to take photos. We had a delightful time. Including tea, lunch for two cost the equivalent of about R300. The experience made my heart happy, and rated – again – as one of my best meal experiences around. How interesting: when I looked back at previous photos I saw the same trolley lady had served us in 2008. LIN HEUNG TEA HOUSE, 160-164 Wellington Street, Central, Hong Kong.